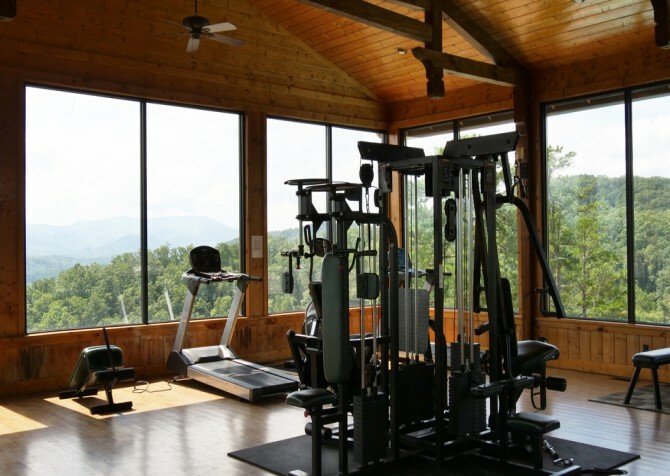 At the cabin, there are plenty of ways to stay entertained and relax – the perfect mix on a vacation to the Great Smoky Mountains. At Legacy Mountain Magic, spend days soaking in the jetted tub, playing pool and arcade games, watching movies on the 65-inch smart TV in the theater room, hanging out with family and friends in front of the fireplace in the cozy living room, soaking in the outdoor hot tub with a TV, enjoying in-cabin meals in the dining area, unwinding on the deck, or sipping a glass of wine or cup of coffee as you sit back in the rocking chairs overlooking the mountains. 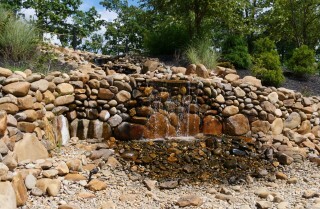 Located in the Legacy Mountain Resort, Legacy Mountain Magic isn’t too far from the fun of downtown Pigeon Forge. Family friendly attractions, local wineries and moonshine distilleries, museums, dinner shows, outlet stores, unique shops, arcades, miniature golf courses, laser tag arenas, go kart tracks, and a wide variety of restaurants provide something for everyone. Add to those the annual events throughout the year – car shows, arts and crafts shows, races, fishing tournaments, holiday parades, kids’ activities, and more – and you’ll never run out of things to do in the Smokies! 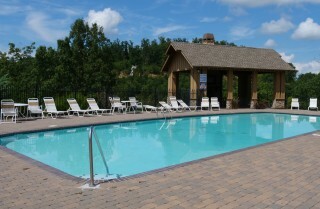 And the community amenities - a gorgeous outdoor pool, steamroom/sauna, pavilion, and gym - are extra perks! A matching leather sofa and loveseat flank a stacked stone fireplace in the simple and comfortable living room of Legacy Mountain Magic. 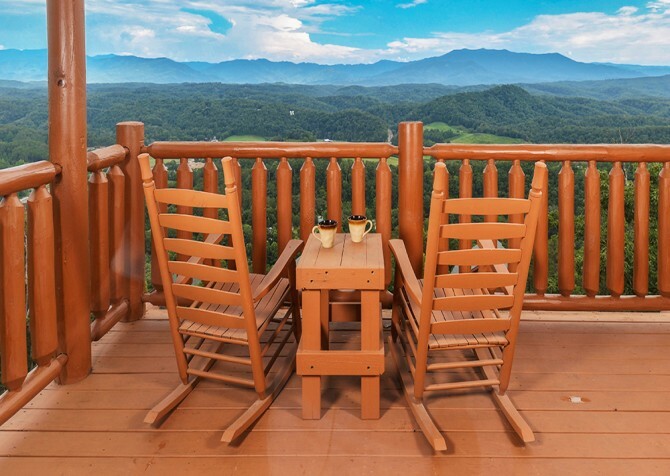 The all-wood space exudes Smoky Mountain charm and is a great place to unwind after a long day. You can bring a deck of cards to play on the coffee table, flip on the big screen TV and watch ball games or movies, or just grab a snack and hang out. You’ll even have a bit of the outdoors in, with several windows that frame tree-studded views around the room. An open floorplan in Legacy Mountain Magic means you get to hang out with other guests when you’re watching TV, sitting down for a snack, or making a drink in the kitchen. 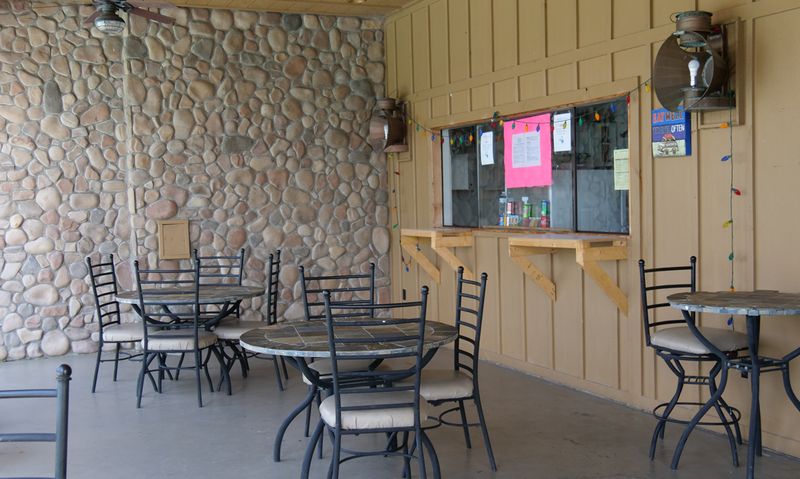 The fully equipped kitchen here is a nice convenience, giving you a place to make snacks, create big breakfasts, or make easy lunches and dinners for the group. Natural wood cabinets pair with black-and-stainless-steel appliances for a clean, polished look. You’ll have a refrigerator, dishwasher (yay for easy cleanup on vacation! 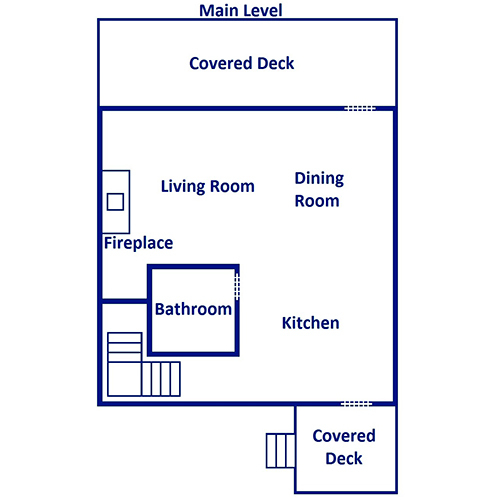 ), built-in microwave, and stove/oven to make mealtime easier. The cabin is also equipped with a coffeemaker, blender, toaster, knife block, and enough glassware, utensils, and dishes for all 6 guests. The Old Mill and The Apple Barn are great picks for getting pancake and biscuit mixes, salsas and jams, and easy in-cabin treats. You can also get fresh fruits and veggies from the Gatlinburg Farmers Market or stock the cabin with a quick trip to the grocery store. Not up for cooking? Just order some pizza, grab some takeout, or get one of our gift baskets that are filled with goodies for the kitchen! Just off the kitchen is the dining area with a table for 4. Sit down for peaceful meals in the cabin here when you don’t want to get out. You can make a big country breakfast, whip up some sandwiches or pasta, or just order some takeout and sit down for an easy dinner together. The kitchen also features a breakfast bar with seating for 2, where you can have a cup of coffee or seat a couple friends from the Legacy Mountain Lazy Bear side! It’s always nice to have a comfortable, quiet place to come home to after busy days hiking in the Great Smoky Mountains National Park, riding the trolley along the Parkway, playing at Dollywood, or exploring The Island. In the bedroom of Legacy Mountain Magic, curl up in a king-size bed at the end of the night. Log nightstands sit on either side of the bed, with lamps for late-night reading. You’ll even have a taste of the outdoors here, with a large window framing tree-studded views! You can unpack in the dresser, flip on the flatscreen TV mounted in the corner, and treat yourself to a luxurious bath in the jetted tub in the bathroom. The cabin also features a new twin-over-twin bunk bed for more guests! It’s movie night in the cabin, and you’ll get more than a big screen TV here. The theater room does boast a 65-inch smart TV, but it also has DVD and Blu-ray players, movie posters, and 4 theater-style chairs with their own cup holders! Stream your Netflix or favorite shows for the ultimate movie-watching experience! Your whole group can watch a movie here together, with mountain views just through the windows. Just pop some popcorn, grab your favorite candy, get a drink, and enjoy a laid-back movie night in the cabin. 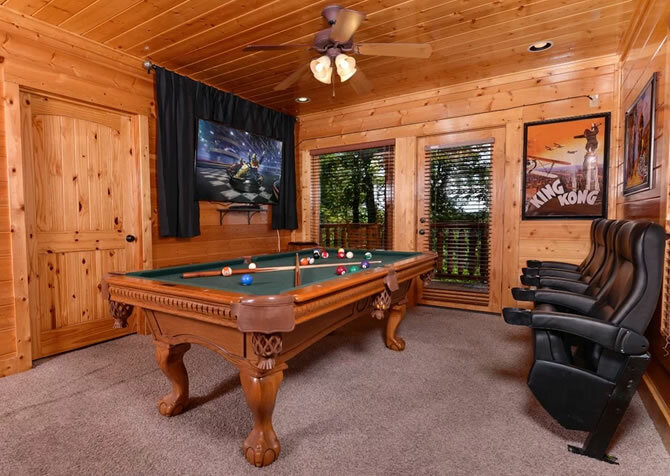 The theater room also serves as the rec room, where you can play a round of pool, check out the 60-game multicade, and hang out. 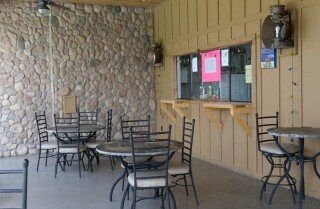 You can take and intermission for a game of pool or some fresh air, with easy access to the deck here. It’s a great place to relax and enjoy some laid-back time on vacation. 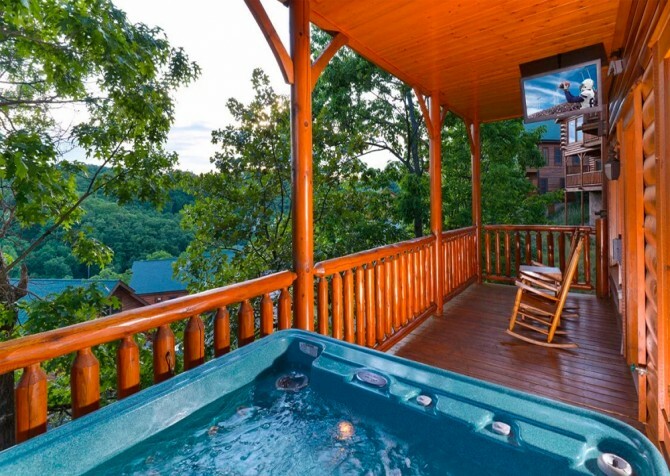 Smoky Mountain days were meant to be spent in the great outdoors, relaxing and soaking in the scenery. At Legacy Mountain Magic, take some time to unwind and enjoy your natural surroundings. In the mornings, grab a cup of coffee and find a rocking chair looking out at the trees. It’s a refreshing way to start the day! At night, take a jar of moonshine, a cup of iced tea, or a glass of local wine onto the deck to let the cool mountain breeze wash over you. 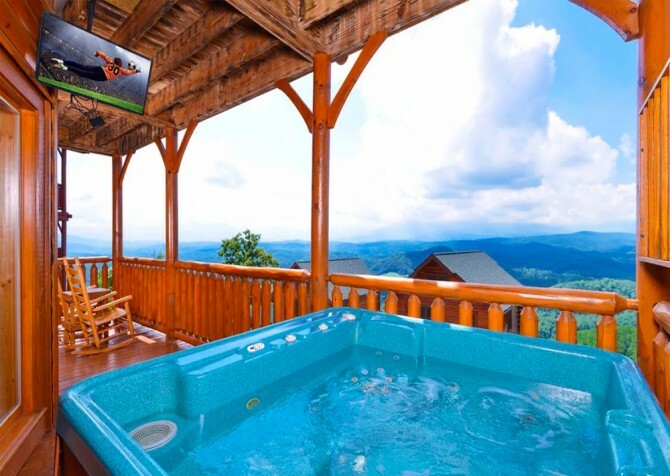 Or climb into the hot tub with a TV to soothe tired muscles. With trees all around and the mountains in the distance, you’ll enjoy peaceful days and quiet nights at the cabin. 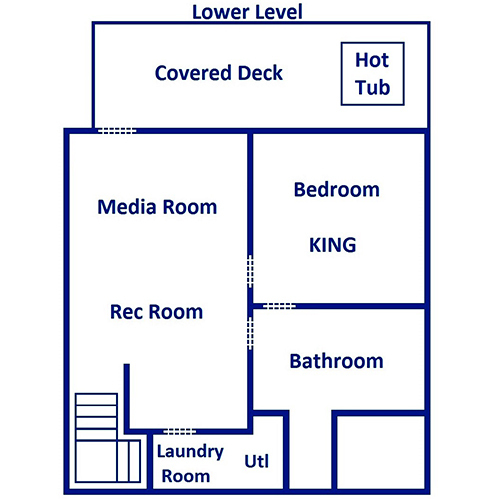 Stay connected with the wireless internet in the cabin, stay on top of laundry with the washer/dryer, and bring along your favorite movies to pop in the DVD and Blu-ray players. TVs in the bedrooms mean no fighting over remotes at night, and a queen sleeper sofa gives a little extra sleeping space. Plus, the cabin has a charcoal grill for cookouts! 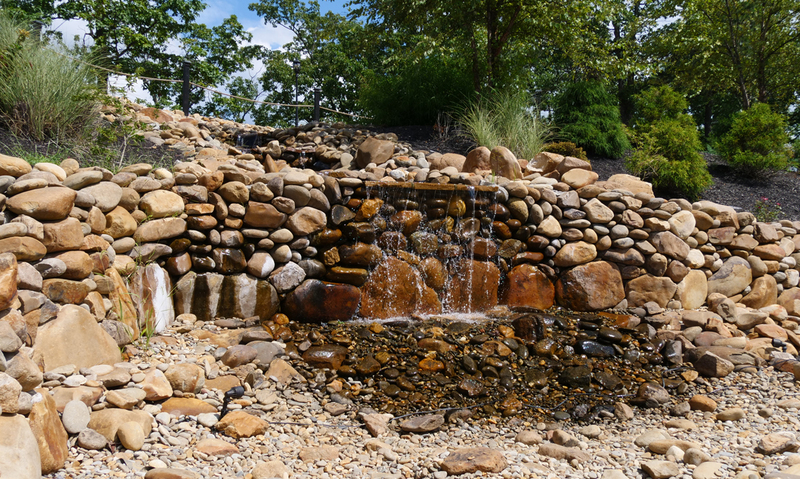 At Legacy Mountain Magic, you’ll have tons of great amenities in the cabin – plus awesome perks in the Legacy Mountain Resort community! You can splash around in the gorgeous outdoor pool on hot summer days, soothe tired muscles in the steamroom/sauna after long hikes, take advantage of the community center, have picnics at the pavilion (with a TV and fireplace), and work out in the exercise room with stellar views! They even have space available for outdoor weddings! There is no shortage of fun in Pigeon Forge, with family-friendly events, fun attractions, couples’ activities, outdoor fun, unique shops, and more. There is something for kids and adults of all ages, so you can find something for couples, little kids, teens, grandparents, and everyone in between. Legacy Mountain Magic has enough amenities to keep you in the cabin, but you don’t want to miss the chance to explore some. Watch talented riders and beautiful horses showcase their skills at Dolly Parton’s namesake show in downtown Pigeon Forge – all while enjoying a hearty 4-course meal! From waterfall and wine tours to customized group activities, the pros at Smoky Mountain Guides offer a wide range of group activities and outings. In neighboring Gatlinburg, this top-rated aquarium is home to tens of thousands of underwater creatures, including sharks, sea turtles, stingrays, and fish! "Loved the cabin. Our own little oasis. We loved the arcade game and pool table not to mention the hot tub. Beautiful view. Quiet area." Thank you so much for this wonderful review! We are glad you enjoyed your little oasis!